Csaba Szabo will deliver the IUBMB Lecture at the 44th FEBS Congress in Krakow. In this short interview, he flies the flag for interests away from the crowds and for ‘uncool’ methods. Csaba Szabo is an internationally recognized expert in the fields of oxidative and nitrosative stress, gaseous transmitters, cell death, cell dysfunction, cardiovascular disease and inflammatory mechanisms. He currently leads a multidisciplinary team at the Department of Pharmacology at the University of Fribourg, Switzerland. He has received numerous awards, including the Novartis Award of the British Pharmacological Society, the Dennis Gabor Innovation Award, the Texas Star Award and the Pharmacia-ASPET Award for Experimental Therapeutics. Csaba Szabo has published over 500 original research articles, and, with an H-index of 125, and with total citations over 60,000, he has been listed as one of the ten most cited pharmacologists in the world for the last decade. What drew you to your research field? One of my current interests is the biology of hydrogen sulfide (H2S). About 20 years ago, a series of papers appeared suggesting that H2S can be produced from mammalian cells and tissues and it might play a role in cell-to-cell communications and in intracellular signalling. A brilliant and unassuming Japanese scientist, Hideo Kimura, is the original pioneer in this field. To be honest, not a lot of people became interested in H2S biology; perhaps they thought it was weird. Even nowadays it is still considered a fairly "specialist" field, but some of us became fascinated with this strange and "smelly" idea. Interestingly, a lot of us – including myself – who work in the field of H2S biology are investigators who have previously worked on nitric oxide (NO), another small, gaseous messenger – and a rather unique biological mediator. In the field of H2S, we can make use of some of the concepts and mechanisms and experimental approaches we learned with NO. We can also study the interactions and comparative roles of these two mediators – which are now, together with carbon monoxide (CO), grouped together as "biological gases". In 2013 we published a paper in PNAS that demonstrated that colon cancer cells produce high amounts of H2S, and use it for their own biological functions, such as bioenergetics, metabolism, angiogenesis and proliferative signalling (https://doi.org/10.1073/pnas.1306241110). This paper followed up an earlier one we published in 2009 showing that endogenous H2S plays an important role in the stimulation of angiogenesis (https://doi.org/10.1073/pnas.0908047106). The findings in these papers were not only interesting from a biochemical or pathophysiological standpoint but also opened new translational directions for the diagnosis (detecting this excess H2S produced by cancer cells) and therapy (pharmacologically inhibiting H2S biosynthesis in cancer cells) of cancer. We have been working in this field ever since and created some small molecules that target this pathway and exert anticancer effects. What’s your lab management style? I like the Steve Jobs quote "It doesn't make sense to hire smart people and tell them what to do; we hire smart people so they can tell us what to do." When I start a new group, or when I bring in a new investigator into my group, I first make sure he or she gets familiar with the fundamental concepts and approaches of the field, and start him or her on a few ideas and projects, but soon enough – if the person is really good – one experiment will lead to another, and my team members will start to come up with brilliant suggestions and ideas, so that we develop and progress the projects together. People who work with me always emphasize how they appreciate the trust and creative freedom I give them to develop and progress our science. What comes first: technique or biological question? Neither. For me, it is a medical question. I am originally trained as a medical doctor, even though subsequently I also completed two PhDs: one in physiology and one in pharmacology. I like to tackle big, unsolved medical problems – the bigger the better. Next, I try to see if the pathways or mechanisms that I have expertise in have any role in their pathogenesis. I am interested in a lot of different diseases. Maybe some people will find this approach unfocused, or too broad: I don't think that there are many people who study, at the same time, neurological diseases, metabolic diseases, vascular diseases, inflammation, critical illness and cancer. As for techniques... to be honest, I was never really fascinated by techniques per se. We always try to use the simplest technique to get an answer to the question as quickly as possible – even if the technique is not currently considered "cool" or "cutting edge" and even if the paper using the "uncool" method will not be publishable in the "trendiest" or highest-impact-factor journal. One of my original mentors, Nobel Laureate Sir John Vane, was perfectly OK using simple tissue strips, organ baths and other "outdated" techniques! And he came up with brilliant insights and observations using them, even in the early 1990s when I studied under him. Even in 2019, a lot of important questions can be answered by a combination of physiological and pharmacological approaches. I remain, fundamentally, a medical doctor and a physiologist/pharmacologist, and therefore I am not at all ashamed of using classical physiological/pharmacological approaches in my work. I think my approach is vindicated by the number of citations my papers received – even though most of these papers were published in "smaller" journals and almost all of them use predominantly "uncool" or "old-school" techniques. I think that, ultimately, the validity of the conclusions and biomedical implications of a study matter much more than the techniques that were used in the paper. What worries you about life sciences research currently? I am worried that insufficient research funding and a hypercompetitive funding environment drives away many smart young people from pursuing biomedical research. They feel that this is an area where it is too difficult to get established to build a steady and stable career – and when I take an honest look at the grant funding percentiles, I can't really blame them. It also worries me what I see whenever I open the website "retractionwatch". A worryingly large number of people who call themselves "scientists" are doing all kinds of shenaniganry, from taking "shortcuts" to engaging in all manners of outright scientific fraud: image manipulation and much worse. Science used to be a noble – almost sacred – occupation. I feel like those days are, sadly, over and I am not sure what it will take to reverse this trend. In the mid1990s Csaba Szabo pioneered the concept that identified the pathogenetic role of the nuclear enzyme PARP in promoting cell necrosis, and its roles in cardiovascular and inflammatory diseases. His applied research and development work in this area led to novel drug candidates that have progressed into clinical trials. 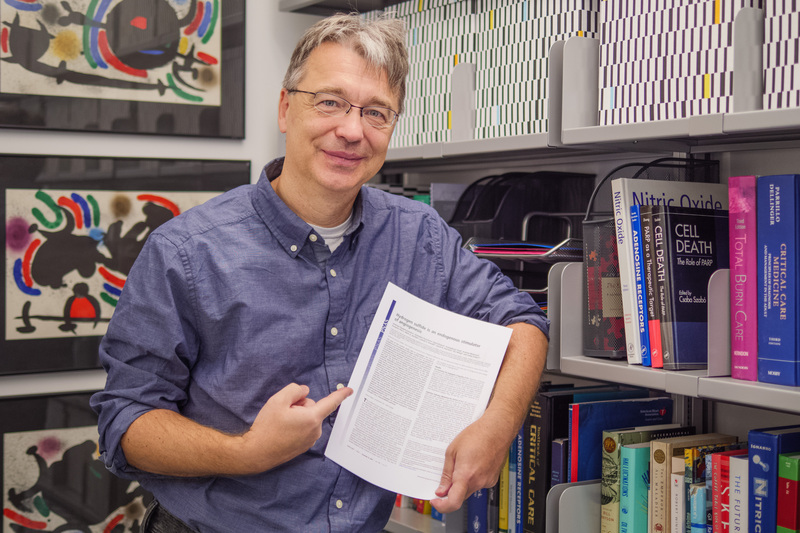 Over the past decade, he has developed a significant track record in the biology of hydrogen sulfide, where he has identified multiple regulatory roles of this mediator in angiogenesis, reperfusion injury and cancer. His research group at the University of Fribourg spans expertise in molecular biology, cell biology, pharmacology, physiology, pathophysiology, medicinal chemistry and translational science, and is addressing the biological and pathophysiological roles of various labile, diffusible small biological molecules.